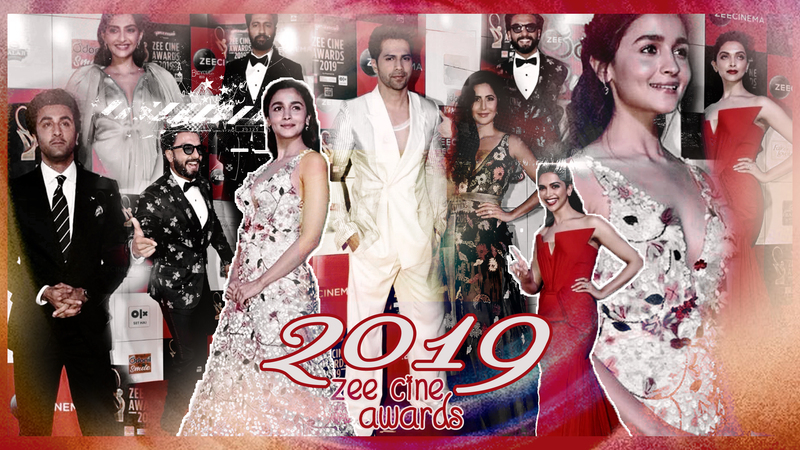 The much-anticipated Zee Cine Awards took place on the 19th March, 2019, and India-Forums couldn't resist reviewing the star-studded event. From the evergreen Hema Malini to the stunning Janhvi Kapoor; from the talented Sanjay Leela Bhansali to the brilliant Ganesh Acharya, each and every one of the stars dazzled on the red carpet. But we, at India-Forums, couldn't help but notice that many of them played it safe. This left our inner fashionistas quite unimpressed. Here is a look at the current rulers of hearts who either nailed the look, or played it too safe to impress us. With beach waves, light make up, and a beautiful black gown by Reem Acra, Katrina Kaif looked perfect for the red carpet event. The floral design coupled with a V neck, along with a golden ribbon tied around her waist took the whole attire a notch up. The flower motif also seemed to bring a pop of colour to what would have been an otherwise bland gown. The outfit was accessorized with simple earrings and a ring which made the whole ensemble look simple and elegant. Huge props to her stylist Tanya Ghavri for this beautiful look. Dressed in a lilac Maison Yeya gown with a deep V neckline, Sonam K. Ahuja would have looked like the true fashionista, if it hadn't been for the cape. Not only did the cape hide her curves, it also threw the whole look out of the window. Moreover, Ahuja's choice of dress looked average compared to her usual impressive selections. She kept her hair in a classic middle-part style, drawing the focus to her face. She accessorized the outfit perfectly with matching Diagold earrings and a Jimmy Choo clutch, leaving her neck bare to draw all attention to the gown. Had she ditched the cape, however, we would have been much more enthralled, and the result would have been more favourable. Alas, the cape was present and thus, this look styled by her sister Rhea Kapoor has earned a thumbs down. If there was anyone who grabbed our eyeballs the moment she stepped on the red carpet, it was Deepika Padukone in a red Gaurav Gupta ensemble. The unique neckline with a low back was a bold move and it paid off. With red lipstick, minimal accessories, and a half-up-half-down hairdo, Padukone made sure our focus remained on her. The only complaint we have is the colour of her gown. She seemed to play it safe by choosing red, a generic and rather done to death colour on the red carpet (pun intended), as a result of which she earns a 4 out of 5. The lovely Alia Bhatt chose a pink gown designed by Celia Kritharioti for the event. Bhatt looked ethereal in her colourful floral gown with the plunging neckline. The whole outfit managed to turn heads, and the simple hairstyle complimented the entire look. Our only complaint with her ensemble was the lack of accessories; a simple bracelet or danglers would have done wonders! Other than that, Bhatt looked as pretty as a princess. We approve of Ami Patel's styling! Vicky Kaushal went for the classic look with a black suit, white shirt, and black bow-tie. Two words: we approve! With a combination that can never go wrong, Kaushal bravely chose to wear an embellished suit by Amit Aggarwal, and we are left begging for more. His outfit only emphasized his good looks, as he chose to keep his hair tousled and beard trimmed. All credit must go to his wonderful stylist Amandeep Kaur, who has done a fabulous job with his look! Experimenting with colours might get brownie points from us, but going for a powder blue and white odd-looking jacket is not the way to our hearts. Varun Dhawan disappointed us when he chose to come to the event dressed in white pants and an off-white jacket with a hint of powder blue, sporting a design that looked like it was taken straight from the 70s. To further down play a semi casual outfit, Dhawan showed up in sneakers. With dishevelled hair, we are not sure what Dhawan is trying to achieve here. One thing is for sure, he won't win any awards for his fashion this time. For someone who has always made the funky fashion choices, Ranveer Singh impressed us with his look for once. Singh sported a classic three-piece black suit by Rohit Gandhi and Rahul Khanna, with a black bowtie and a white shirt, but added his own charm to it. The vest and coat were covered in butterfly prints. The result was a fusion of the classic and crazy, making the whole outfit look unique and oh-so-Ranveer. With the outfit matching with a pair of shades and his hair gelled to perfection; Singh's stylist Nitasha Gaurav got the formula just right. Ranbir Kapoor is well known for playing it safe when it comes to fashion, so we were not surprised to see this look on him, though he went too far this time and came out with a rather bland look. Kapoor went with a simple black suit and striped tie combo with a white shirt. The result looked like he was on his way to a business conference, rather than to a gala event. His final appearance ended up being too bland for us to appreciate, with his messy hair and a 6 o' clock shadow. We give a solid thumbs down to this look. Zee Cine Awards is a national event that will soon be telecast all over the country. For such a popular and prestigious event, we expected our Bollywood celebrities to dazzle us with their fashion choices. Alas, we were left with a dry taste in our mouths. Even Karan Johar and Malaika Arora, the ones who normally impress us with their looks, let us down. However, some B-Town ladies were the epitome of elegance, grace and poise, such as Madhuri Dixit Nene, Dia Mirza, and Sunny Leone. We appreciate their efforts and wish the other beauties of Bollywood step up their fashion game. Men, do continue to experiment, but remember to not stray so far into the realm of experimentation that it flops. According to you, which of these stars were perfectly dressed for the occasion, and who failed to impress you? Do let us know with your comments below! Writers: Kalpana K.C. and Shreya S.
Editors: Ritchelle C. and Mohini N.
Have a suggestion or comment for us? Drop us a PM at BC_Dropbox today! Nawazuddin SHARES about his love English movies! Kartik Aaryan achieves this MILESTONE at Zee Cine Awards!